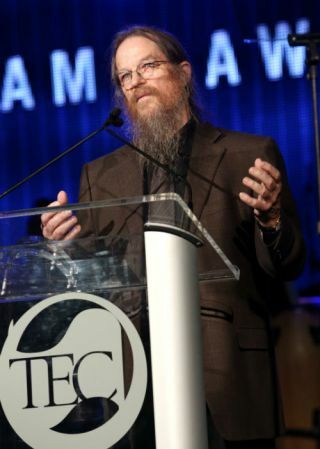 John Meyer, CEO and co-founder of Meyer Sound Laboratories, was inducted into the TEC Awards Hall of Fame at the 2014 NAMM Show. Following an introduction by Dennis "Wiz" Leonard, long-time FOH mixer of the Grateful Dead, Meyer received the award as he joined Frank Zappa, Phil Spector, T Bone Burnett, and 30 other luminaries who have shaped the art and science of music, recording, and sound reinforcement technologies. John Meyer’s role as an audio innovator extends to the late 1960s, when he consulted on audio for the Steve Miller Band. Since establishing Meyer Sound in 1979, John Meyer and his wife, Helen Meyer have led an engineering team that is responsible for not only pioneering self-powered concert loudspeakers, but also introducing breakthrough developments including dedicated loudspeaker processing, SIM™ source independent measurement tools, trapezoidal loudspeaker cabinets, directional subwoofers, and more. Products designed and manufactured under Meyer’s direction are now installed in many of the world’s most prestigious concert venues, and have toured with artists ranging from the Three Tenors to Michael Bublé.